In Chapman's view, NASA's proper roles in human space flight are to develop technologies needed by private enterprise in space, to reduce the present barriers to private investment in facilities off-Earth, and to provide those services that can best be handled by the government, such as space traffic control and search and rescue. Most astronauts should be employed by corporations working in space, he feels, and not by NASA. ''It is very unfortunate that the Shuttle proponents won this argument, because it has proven a catastrophe for NASA, and for human space flight. The Shuttle was supposed to be at least ten times cheaper to fly than the Saturn vehicles, but in fact it is ten times more expensive. In other words, the Shuttle programme missed its cost goals by a truly incredible 10,000 percent! As a result, the average cost of a Shuttle flight is an astounding US$600,000,000, so NASA can afford only a few missions each year. Faced with a declining budget and rising costs, NASA was soon forced to cut back in other areas. 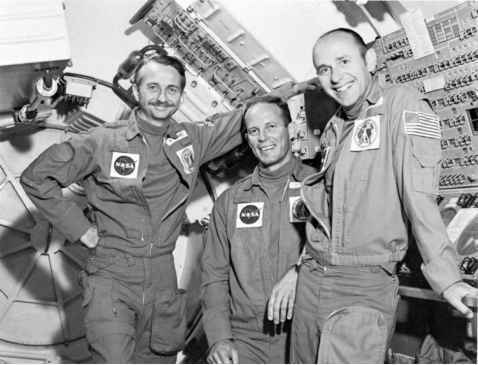 The Borman committee recommendations about making Skylab B permanent were rejected, and then the whole second Skylab project was cancelled. This was a major blow for Chapman, as he had hoped to fly in that workshop, and was in fact developing two experiments in general relativity that he could undertake there. "The Skylab in which I hoped to live is now a tourist attraction in the Smithsonian Air and Space Museum. I sometimes visit it when I am in Washington, but it is very sad to see it wasted." Chapman was disgusted with what he calls "the monumental stupidity of the course NASA had chosen." Moreover, it was now clear that none of his group of scientist-astronauts would get into space for at least another decade. With his views diverging so sharply from the course NASA was taking, he reluctantly decided, in July 1972, that he needed to find a better way to contribute to space flight than simply hanging around in Houston, working on that so-called "Giant Leap" in which he had no confidence.